There are two overarching Errors of Perfect Propriety throughout the film. First, Rose DeWitt Bukater (Kate Winslet) never wears a hat on board ship when other ladies are hatted. For all Etiquetteer knows, it was part of Ms. Winslet's contract only to wear that stunning black hat when boarding the ship. But a young lady of the Main Line traveling to her wedding would have been properly dressed -- especially when traveling with her fierce mother (Frances Fisher). Naughty naughty! 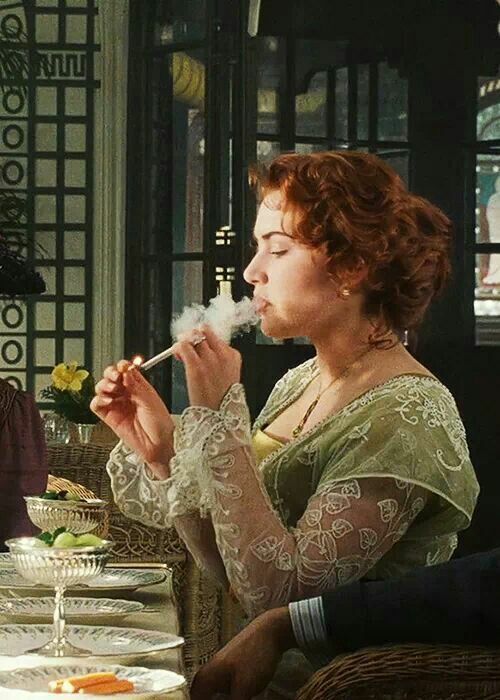 While smoking was certainly not Perfectly Proper for ladies in 1912, not even gentlemen would smoke at the table. The costumers decided to ignore the cold hard fact of the cold hard temperatures of the mid-Atlantic in April. Everyone on deck is underdressed for the weather! There should be a lot more fur coats, knitted caps, shawls, etc. than one sees. Jack Dawson ought to have frostbite and chilblains after that whole "I'm king of the world!" thing. Trudy Bolt (Amy Gaipa), the lady's maid for Rose and her mother, is shown incorrectly wearing a maid's uniform. A lady's maid had sufficient status as a servant to wear her own (very plain) clothes while traveling, without an apron. She was also properly addressed by her last name, not her first, the same way a butler is called by his last name. It's worth noting that the Titanic included a private lounge for the servants of first-class passengers. In real life, Margaret Brown (Kathy Bates) was much more accepted in Best Society. The whole "Unsinkable Molly Brown" thing got started after her death. As Mrs. Brown passes Rose and her mother to the elevator, we see the latter ladies in full evening dress on the way to the dining saloon. What the writers have failed to remember is that no one dressed for dinner on the first night out, or the last. Presumably this was because one's servants were still unpacking, or packing. Anyone showing up in full dress on the first night would have been pegged as a parvenu on his or her first appearance. 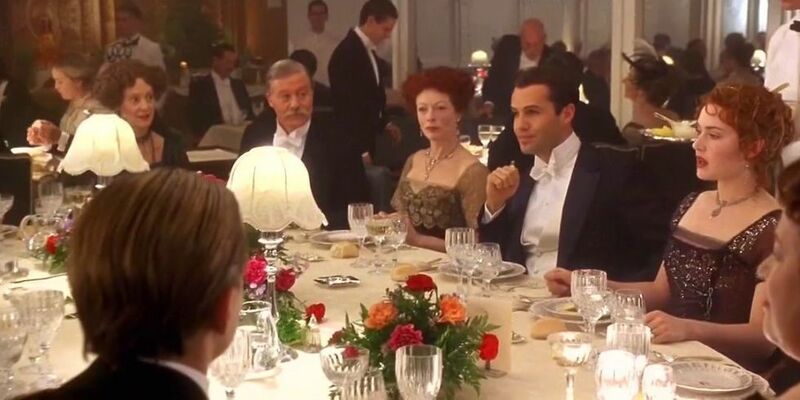 During the first dinner scene in the first-class dining saloon, a gentleman sitting next to Mrs. Dewitt Bukater is seen gesturing with his oyster fork. Well-bred ladies and gentlemen were taught (and should still be taught) never to gesture with their utensils! You could put someone's eye out at worst, or even propel a gobbet of food onto someone's clothes. Etiquetteer recognizes that it's necessary for the plot, but the idea of a young gentleman going into his fiancée's bedroom in his pajamas ... gracious sakes! Even having them share a suite like that is stretching Perfect Propriety, especially since it appears her mother is not sharing her stateroom. Only the vulgar seek out such large stones ... which explains the Duchess of Windsor. "Philadelphia Society" is not correct. "Main Line Society" is correct. J. Bruce Ismay, smoking in the Palm Court. Not possible! He would only have done so in the smoking room (see above). That whole spitting lesson thing absolutely strains credulity. At a dinner table that large, conversation would not have been general, simply because one would have to shout to be heard at the other end of the table (and this was a public dining room). One talked one's neighbor on one side during the first course and the other side during the next course, alternating throughout the meal. This is called "turning the table" and if done properly means that no one is left out of the conversation. Oh, Etiquetteer does love Frances Fisher! God bless the grandes dames of yore, who knew how to put a climber in the proper place. It would have been much too cold for Rose to breakfast on that private promenade deck in that practically sleeveless negligée. Inconceivable that Rose would make a "splendid gesture" like that to a servant. Thank you for indulging Etiquetteer in this little exercise.